I have seen interesting posts explaining subtleties about git reset. Unfortunately, the more I read about it, the more it appears that I don't understand it fully. I come from a SVN background and Git is a whole new paradigm. I got mercurial easily, but Git is much more technical. I think git reset is close to hg revert, but it seems there are differences. consequences on the working copy, the HEAD and your global stress level. Remember, reset doesn't make commits, it just updates a branch (which is a pointer to a commit) to point to a different commit. The rest is just details of what happens to your index and work tree. I cover many of the main use cases for git reset within my descriptions of the various options in the next section. It can really be used for a wide variety of things; the common thread is that all of them involve resetting the branch, index, and/or work tree to point to/match a given commit. --hard can cause you to really lose work. It modifies your work tree. git reset [options] commit can cause you to (sort of) lose commits. In the toy example above, we lost commit C. It's still in the repo, and you can find it by looking at git reflog show HEAD or git reflog show master, but it's not actually accessible from any branch anymore. Git permanently deletes such commits after 30 days, but until then you can recover C by pointing a branch at it again (git checkout C; git branch <new branch name>). Paraphrasing the man page, most common usage is of the form git reset [<commit>] [paths...], which will reset the given paths to their state from the given commit. If the paths aren't provided, the entire tree is reset, and if the commit isn't provided, it's taken to be HEAD (the current commit). This is a common pattern across git commands (e.g. checkout, diff, log, though the exact semantics vary), so it shouldn't be too surprising. For example, git reset other-branch path/to/foo resets everything in path/to/foo to its state in other-branch, git reset -- . resets the current directory to its state in HEAD, and a simple git reset resets everything to its state in HEAD. There are four main options to control what happens to your work tree and index during the reset. Remember, the index is git's "staging area" - it's where things go when you say git add in preparation to commit. --hard makes everything match the commit you've reset to. This is the easiest to understand, probably. All of your local changes get clobbered. One primary use is blowing away your work but not switching commits: git reset --hard means git reset --hard HEAD, i.e. don't change the branch but get rid of all local changes. The other is simply moving a branch from one place to another, and keeping index/work tree in sync. This is the one that can really make you lose work, because it modifies your work tree. Be very very sure you want to throw away local work before you run any reset --hard. --mixed is the default, i.e. git reset means git reset --mixed. It resets the index, but not the work tree. This means all your files are intact, but any differences between the original commit and the one you reset to will show up as local modifications (or untracked files) with git status. Use this when you realize you made some bad commits, but you want to keep all the work you've done so you can fix it up and recommit. In order to commit, you'll have to add files to the index again (git add ...). --soft doesn't touch the index or work tree. All your files are intact as with --mixed, but all the changes show up as changes to be committed with git status (i.e. checked in in preparation for committing). Use this when you realize you've made some bad commits, but the work's all good - all you need to do is recommit it differently. The index is untouched, so you can commit immediately if you want - the resulting commit will have all the same content as where you were before you reset. To be more concrete, suppose you've modified files A and B, and you attempt to merge in a branch which modified files C and D. The merge fails for some reason, and you decide to abort it. You use git reset --merge. It brings C and D back to how they were in HEAD, but leaves your modifications to A and B alone, since they weren't part of the attempted merge. HEAD~ is short for HEAD~1 and means the commit's first parent. HEAD~2 means the commit's first parent's first parent. Think of HEAD~n as "n commits before HEAD" or "the nth generation ancestor of HEAD". HEAD^ (or HEAD^1) also means the commit's first parent. 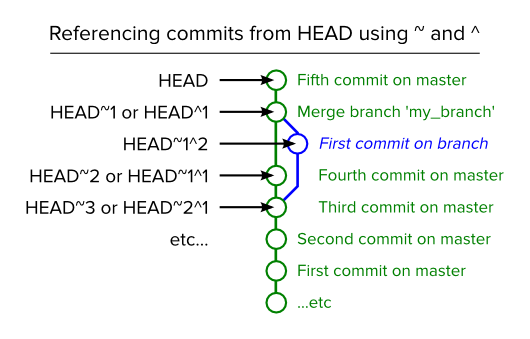 HEAD^2 means the commit's second parent. Remember, a normal merge commit has two parents - the first parent is the merged-into commit, and the second parent is the commit that was merged. In general, merges can actually have arbitrarily many parents (octopus merges). The ^ and ~ operators can be strung together, as in HEAD~3^2, the second parent of the third-generation ancestor of HEAD, HEAD^^2, the second parent of the first parent of HEAD, or even HEAD^^^, which is equivalent to HEAD~3. --soft moves HEAD but doesn't touch the staging area or the working tree. --mixed moves HEAD and updates the staging area, but not the working tree. --merge moves HEAD, resets the staging area, and tries to move all the changes in your working tree into the new working tree. --hard moves HEAD and adjusts your staging area and working tree to the new HEAD, throwing away everything. Use --soft when you want to move to another commit and patch things up without "losing your place". It's pretty rare that you need this. touch foo                            // Add a file, make some changes. git commit -m "bad commit message"   // Commit... D'oh, that was a mistake! git reset --soft HEAD^               // Go back one commit and fix things. git commit -m "good commit"          // There, now it's right. Use --mixed (which is the default) when you want to see what things look like at another commit, but you don't want to lose any changes you already have. Use --merge when you want to move to a new spot but incorporate the changes you already have into that the working tree. Use --hard to wipe everything out and start a fresh slate at the new commit. The post Reset Demystified in the blog Pro Git gives a very no-brainer explanation on git reset and git checkout. That is basically it. The reset command overwrites these three trees in a specific order, stopping when you tell it to. There are also --merge and --keep options, but I would rather keep things simpler for now - that will be for another article. so, its simple now. We have to work in working directory, creating files, directories and all. These changes are untracked changes. To make them tracked, we need to add them to git index by using git add command. Once they are added to git index. We can now commit these changes, if we want to push it to git repository. It Clears your index, leaves your working directory untouched. (simply unstaging everything). It can be used with number of options with it. 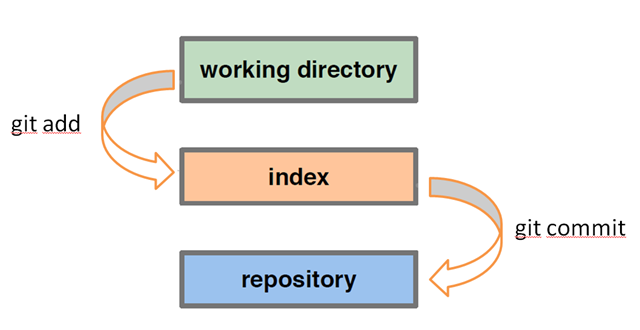 There are three main options to use with git reset: --hard, --soft and --mixed. These affect what get’s reset in addition to the HEAD pointer when you reset. First, --hard resets everything. Your current directory would be exactly as it would if you had been following that branch all along. The working directory and the index are changed to that commit. This is the version that I use most often. git reset --hard is something like svn revert . Next, the complete opposite, —soft, does not reset the working tree nor the index. It only moves the HEAD pointer. This leaves your current state with any changes different than the commit you are switching to in place in your directory, and “staged” for committing. If you make a commit locally but haven’t pushed the commit to the git server, you can reset to the previous commit, and recommit with a good commit message. Finally, --mixed resets the index, but not the working tree. So the changes are all still there, but are “unstaged” and would need to be git add’ed or git commit -a. we use this sometimes if we committed more than we meant to with git commit -a, we can back out the commit with git reset --mixed, add the things that we want to commit and just commit those. In simple words, git reset is a command to "fix-uncommited mistakes" and git revert is a command to "fix-commited mistake". It means if we have made some error in some change and commited and pushed the same to git repo, then git revert is the solution. And if in case we have identified the same error before pushing/commiting, we can use git reset to fix the issue. I hope it will help you to get rid of your confusion. git reset resets Staging to the last commit. Use --hard to also reset files in your Working directory to the last commit. If git revert is a “safe” way to undo changes, you can think of git reset as the dangerous method. When you undo with git reset(and the commits are no longer referenced by any ref or the reflog), there is no way to retrieve the original copy—it is a permanent undo. Care must be taken when using this tool, as it’s one of the only Git commands that has the potential to lose your work. On the commit-level, resetting is a way to move the tip of a branch to a different commit. This can be used to remove commits from the current branch. Please be aware, this is a simplified explanation intended as a first step in seeking to understand this complex functionality. Checkout points the head at a specific commit. Not the answer you're looking for? Browse other questions tagged git reset or ask your own question. How can I unstage my files again after making a local commit? Is there a difference between “git reset --hard hash” and “git checkout hash”? What is difference between “git checkout -f” and “git reset --hard HEAD”?